Travel with Kevin and Ruth! : 10 years ago today! It was 10 years ago today that we left Ruth's father's place in Galetta (Ottawa) for our very first big road trip with our new to us motorhome Sherman! And here we are ten years later set to take off on another two year planned adventure with Sherman. Who would have thought?! And, we don't see the fun ending any time soon. With any luck at all, we'll be reporting to you 10 years from now with a 20th anniversary report! But, we've still got a few weeks until we take off. Still visiting with friends and family for the next week and a half, and then of course we've got our 19 day "vacation" in Barbados! So, what have we been up to the last few days? 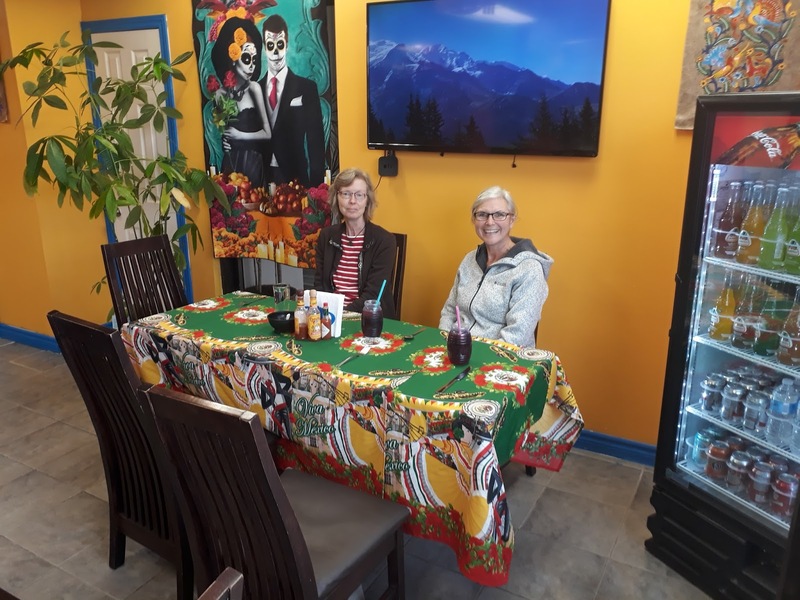 We met with my older sister at a new Mexican restaurant. It was billed as being "authentic", and it definitely was. The couple who run it are from Acapulco, and have been living here since 2013. My sister Elaine, and Ruth. Like I said, it was authentic. The food was exactly the same as what you might get in Mexico. Elaine had carnitas, Ruth had the tortilla soup, and I had chicken enchiladas. The carnitas were good, the tortilla soup was excellent, and my enchiladas were just okay. Overall, a good meal and we had fun doing all of our ordering and talking to the waitress in Spanish, despite the fact that her English was better than our Spanish! She still uses a chair for support. But Cameron is starting to do pretty well on his own. And then yesterday, we took Sadie with us for Grandma and Grandpa time to celebrate her 4th birthday that we missed at the end of August. We took her to community movie day at the local cinema. The films were free! The movie we saw was "Trolls". It was actually quite good, and Sadie enjoyed it. Then, we took her to lunch at Swiss Chalet, and we all enjoyed the meal. 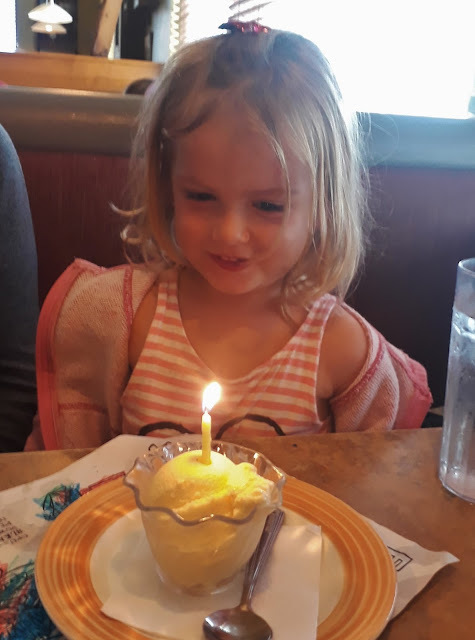 Plus, the waitress overheard that we were celebrating Sadie's birthday and brought her a cup of ice cream with a candle in it, and all the wait staff sang her happy birthday! She sure did enjoy that! Sadie with her birthday ice cream! 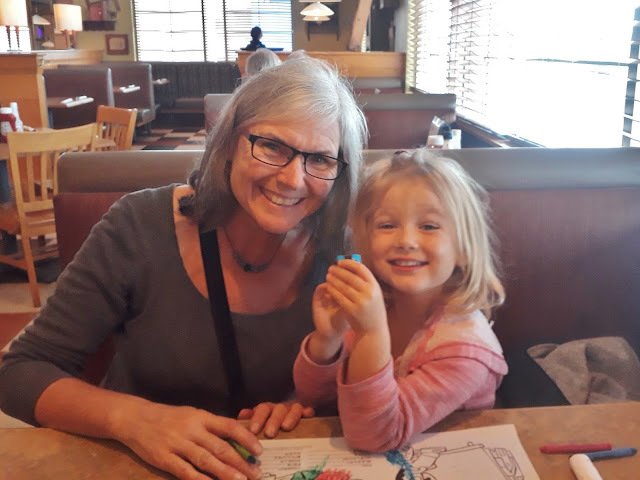 Today, we're going to visit blog readers Judi and Ian who are selling their house soon to buy an RV and wanted to discuss the adventure with us! We love talking about stuff like that! The popular and highly rated Cuisinart Electric Griddle has had a nice price drop! Thank you Chuck and Anneke! 10 years of being on the road and blogging, both huge achievements. To many more! Happy anniversary and thanks for the blog. You two were a great source of information and inspiration that lead to our RV'ing in Mexico. Looks like y'all have been enjoying a lot of family time. Happy Anniversary! Here is to 10+ more years! Looking forward to our next 10 years! We sure hope to have many more years on the road both in the RV and just backpacking around and exploring other countries. Happy ten year anniversary and wishing you many, many more fun filled years of traveling!!!!!!!!!!!!!! Thanks Connie and Barry, we are also hoping for many more years of traveling too! Happy anniversary! Ten years with Sherman and here's to the next ten! Cheers, Peter and Shelagh. Thank you Peter and Shelagh! Congrats on the last ten years. looking forward to the next ten. I'm glad I came across your blog. It's one of my favorites and I enjoy your daily posts and great photos. Adventure on! Thank you Lori! Can't wait to start actually traveling again though.